Leonard Thompson - First Person With Diabetes to receive insulin . It was 94 years ago, today (January 11th, 1922,) that Dr. Frederick Banting gave the first injection of insulin to a 14 year old Canadian boy named Leonard Thompson. Thompson, at a scant 65 pounds and near death, was drifting in and out of a diabetic coma in Toronto�s General Hospital. His parents were beyond desperate and allowed their son to be injected with the experimental drug known as insulin. The first injection caused an allergic reaction, but two weeks later (and after James Collip developed a refining process,) on January 23rd, 1922, Leonard received another injection that and his life was saved. Leonard lived until the age of 27, and passed away from complications of pneumonia and yes, diabetes most likely played a factor in his death. no longer lived with a death sentence. 94 years later, millions rely and use insulin daily - and people with diabetes have gone on to live wonderful lives and do incredible things. But people with diabetes still struggle. We struggle with the cost of staying alive with diabetes . We struggle with our insurance companies and the exorbitant prices we pay for our life saving elixir of life and the cost of our life saving diabetes technologies. Many struggle because they lack insurance - many struggle because they don't have access to insulin. Many people with diabetes struggle with complications, the fear of complications, and the judgement and lack of compassion that having complications brings from others outside and inside the diabetes community. And 94 years after the life saving discovery of insulin, people with diabetes continue to struggle with the fact our disease is misunderstood by so many - and we are still waiting for a cure. 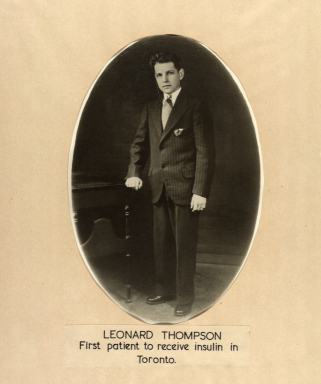 However, no matter the struggles we face or live with, people with diabetes are incredibly grateful to Doctor Banting, Charles Best, George McCloud and James Collip - and to the boy who lived named Leonard Thompson - the first of our diabetes tribe to receive insulin and lived to tell the tale and inspire others.